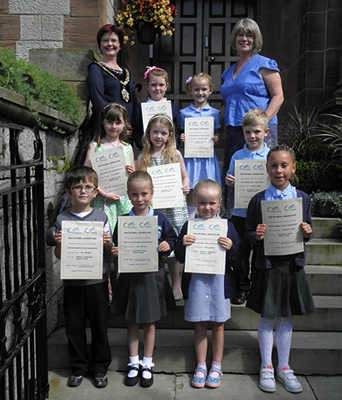 On Monday 14th July, nine children from local Primary Schools were invited to the Town Hall in Colwyn Bay to be presented with prizes for the Colwyn in Bloom Schools Painting Competition 2014, which had the theme of ‘Sunflowers’ to mark the 50th anniversary of the RHS. The competition was open to children aged from 4 to 7 who attend schools in the Bay of Colwyn Town Council area. The Town Mayor, Cllr Val Smith and Mrs Ingrid Lewis, Chairman of the Colwyn in Bloom Group, presented the children with certificates and prizes for being placed in the top three for each of the age categories. The wining paintings will remain on display in the Town Hall until September, to allow any family members or friends of the winners to view them.